Have you ever worked some place where you were shamed for needing to take a poo while on the clock? I'm certain this isn't an uncommon thing - I've been shamed for it, but I've never been ashamed of doing so. Because, let's be realistic - we all poo. We do! And Suzy Batiz, the CEO and creator of the Before-You-GoⓇ Toilet Spray Poo~Pourri shares the same belief that pooing is a-okay, so sh*t-shaming should be a thing of the past. 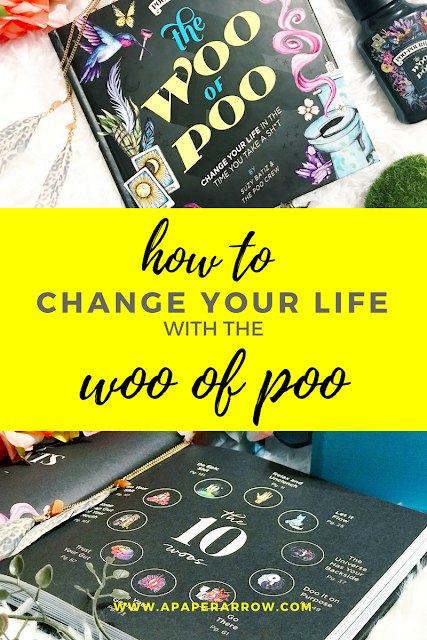 Batiz and her Poo-Crew talk about their ten Woos of Poo in the new self-help book, The Woo of Poo: Change Your Life in the Time You Take a Sh*t. First, let me say - I'm not the biggest self-help fan, but this book is completely different than what's typical. I found myself laughing out loud throughout the entirety of its pages. The ten "woos" range from "relax and unclench," "let it flow," "bare your genius," and "keep crap out of your mouth." It's full of good advice, but with an incredibly healthy mix of poo jokes. It's truly the best of both worlds. While I enjoyed the variety of chapters and there was something in every single chapter that resonated with me, there were some that really stood out to me the most. This chapter talks a lot about clean eating, eating proportionally, and the like. While I'm not always the best eater, I do often try to actively eat better and smaller. The eating portion isn't the only thing that is in this chapter. It also talks about other kinds of crap to keep out of your mouth, like hateful words and negativity. The excerpt below was really beautiful to me, and gives some helpful examples of how to share greatness within the world. The words within the below excerpt really resonated with me, because so far within 2018 I have practiced yoga each and everyday and it's something I hope to continue. While yoga is doing good for my body, the practice is also about bettering your mind and being kind to yourself and others. I loved that pieces of The Woo of Poo really align with that philosophy. I am a firm believer that mistakes are a-okay. They help you learn and grow. If everything was perfect and done the right way all of the time, would we ever really progress past where we are? But I think one of the most important part of making a mistake is owning up to it, so you can learn from it. And chances are, you won't make that mistake again. So, this chapter speaks not only of owning up to your mistakes, but the integrity it takes to be that honest person and also hold true to yourself. I definitely enjoyed reading this book. It was unlike any "self-help" type book I've ever read before, but was full of such great knowledge, fun anecdotes, and hilarious poo puns. Click the image below to buy your copy via Amazon today! So, if you've never heard of Poo~Pourri (have you been living under a rock?) - it's a spray you spritz into the toilet before pooing which prevents the stink from wafting up out of the bowl. It's all-natural, with no synthetic fragrances, alcohol, aerosol, or parabens. Instead it's a pure blend of natural essential oils. You spray three to five pumps before-you-go, which creates a film on the surface of the water, which blocks any stink from making its way out of the toilet. Perfect to tote with you for public poos - so you won't be afraid you do number two whenever or wherever you've got to go. Have you ever used Poo~Pourri? If so, you'll love this book. Are you always looking for ways to be a better you? You'll love this book. Become less ashamed about doing the poo. Learn more about the Poo-Crew (and totally want to work with them). Read The Woo of Poo. Oh my gosh! This is awesome! Might put this in the office restroom! Yes - such a fun one for the office toilet!